Like many other ball clubs, the Cleveland Indians opened spring training in 1963 with some question marks at various positions. One issue was third base, where no incumbent was in line to win the job. During the offseason, Cleveland traded Bubba Phillips, who had manned the hot corner for the previous three seasons, to Detroit. Woodie Held, the starting shortstop from 1959-1962, was being moved over to third base. Held carried a big bat that would be needed in the Tribe lineup. His competition for the starting job was heralded rookie Max Alvis. The 5’11” right-handed hitting Texan had some “pop” in his bat. Alvis was a late-season call up to the varsity in September 1962. He started 12 games, but he needed more playing time to determine if he was ready for the show, considering that Alvis batted only .216 without a home run in his abbreviated first season. Tebbetts predicted that each position player on the Indians would slug at least 20 homers and 20 more off the bench for at least 180 home runs as a team.2 But the Indians fell a bit short of that mark with 169, and only Alvis and Fred Whitfield would top 20 homers for Cleveland. At times, Alvis was thrust into the cleanup spot in the lineup and it was a heavy burden to place on a rookie of a team that did not score many runs (635) and hit only .239. However, Alvis was one of the few bright spots for the Tribe. Alvis was to report to the Indians’ minor league camp in Daytona, Florida, the following spring. But first, he exchanged ‘I do’s’ with his high school sweetheart, the former Frances Mae Eddy on August 23, 1958. They had two sons, Max, Jr. and David. One of the bright spots in 1963 for Alvis came on July 20, at Yankee Stadium. Alvis smacked his twelfth homer run, a solo shot off the left field foul pole, in the fourth inning off of Whitey Ford. The run put Cleveland in front by a 1-0 score. It was short-lived, as Joe Pepitone and Harry Bright each hit two-run homers to help give New York a 5-1 advantage. Ford, meanwhile, retired 15 straight Indians batters. With one out in the ninth inning, Ford had his sights on his eighth complete game, butut a walk to Willie Tasby and a single by Willie Kirkland brought Alvis to the plate. Alvis drove a ball 420 feet to left center that banged off the scoreboard, good for a triple and two RBI. Ford was removed from the game and replaced with Hal Reniff. Fred Whitfield hit a bloop single to center field to score Alvis and bring the Tribe to within one run, 5-4. Johnny Romano then singled to center field, but Reniff snuffed out any further opportunity for Cleveland, as he induced Al Luplow into a 1-6-3 double play. Alvis finished the 1963 season with a team-high 22 home runs, 32 doubles and 67 RBI. He also hit .274 and led A.L. third baseman in putouts (170), a category in which Alvis would also lead the league in three of the following four seasons. Alvis was selected as the 1963 Indians “Man of the Year” by the Cleveland chapter of the Baseball Writers Association of America. For the next three seasons, Alvis was the Indians’ starting third baseman. He had a strong year in 1967, smacking 21 home runs and a driving in a career-high 70 runs. That year, Alvis led third basemen in the league in games played that season with 161 and in putouts (169). He was selected again as a reserve for the A.L. squad in the All Star Game, making it into the game as a pinch hitter in the 10th inning. On July 29, the Indians traded Colavito to the White Sox. Duke Sims said: “Max Alvis probably will win the most popular Indian contest by default with Rocky gone.”14 Alvis was again voted the Indians “Man of the Year” by the Cleveland writers. The Indians finished in third place in the A.L. in 1968. They were led by a terrific pitching triumvirate of Luis Tiant, Sam McDowell and Sonny Siebert. Tiant won 21 games and led the league with a sparkling ERA of 1.60. McDowell led the league with 283 strikeouts and posted an ERA of 1.81. All signs pointed to a successful year for the Tribe in 1969, as they even traded for Ken Harrelson to add punch to their offense. But Tiant led the league in losses with 20, and McDowell was the only Cleveland starter who posted a winning record. For Alvis, he was injured in a ballgame on May 24 against Seattle. He stumbled as he crossed first base in the ninth inning. It was believed to be a strain to his right knee. He was hitting .277 at the time, but sat out for a week. Alvis returned and continued to play until July 10, when his average plummeted to .225. It was decided that he would need surgery, and he was shut down for the rest of the season. Cleveland finished in last place in the newly formed A.L. East Division, 18 games behind the fifth place team and with the worst record in the American League. Cleveland acquired Graig Nettles from Minnesota in the off season, who was part of a six-player deal with Tiant being the key player going to the Twins. Nettles, a left-handed batter, was twenty-five years old and a star in the making. It became apparent in spring training that he would be the new third baseman. 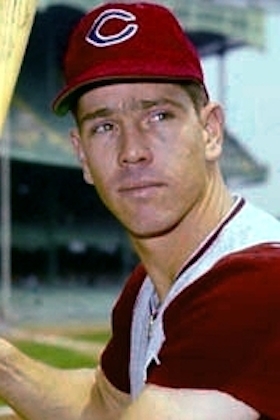 With three days to go before the start of the 1970 season, Cleveland shipped Alvis to Milwaukee with outfielder Russ Snyder. In return, Milwaukee sent outfielder Roy Foster and infielder Frank Coggins and cash to the Indians. Milwaukee used car magnate Bud Selig had purchased the Seattle Pilots and moved them to his hometown of Milwaukee. The Brewers, playing in their first season in 1970, even retained the same uniforms as the Pilots. Alvis started 24 games, mostly serving as a backup to Tommy Harper at third base. Alvis retired from baseball at the conclusion of the 1970 season. Max Alvis’ lifetime batting average during his nine-year career was .247. He totaled 111 home runs and 373 RBIs. Alvis reflected on his illness, which derailed his career. “At the time I wasn’t concerned about the possibility of any after effects,” said Alvis. “I thought I was over and done with it. But in retrospect, I soon realized I didn’t have the same strength, the same stamina and the endurance I’d had before I got sick. I remember that I was constantly changing bats, thinking maybe I should go to one that was lighter, but it didn’t help. After his playing days, Alvis worked at the First National Bank of Jasper. He started as a loan officer, than worked his way up to vice president, and finally president. He was still a fan favorite at Indians fantasy camps and memorabilia shows. His son David was in the Indians minor league chain in the early 1980’s. 1 Hal Lebovitz, Cleveland Plain Dealer, April 10, 1963. 3 Myron Cope, Sport Magazine, August, 1965, p. 90. 4 Charles Burton, Dallas Morning News, July 28, 1958, section 2, p. 1. 5# Dallas Morning News, July 27, 1958, section 2, page 5. 6 Terry Pluto, The Curse of Rocky Colavito, Fireside, New York, NY, 1994, p. 116. 7 Myron Cope, Sport Magazine, August, 1965, p. 91. 12# Max Nichols, Sporting News, June 26, 1965, p. 9.